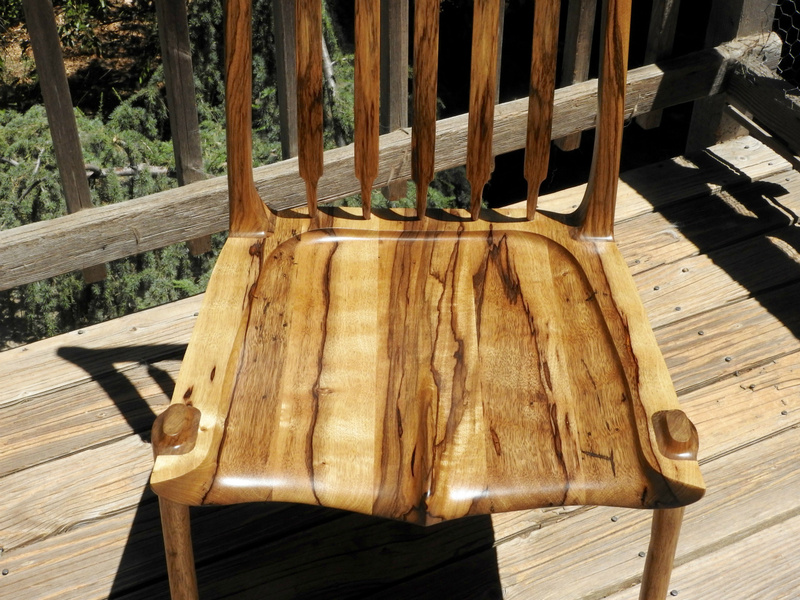 Seat detail of black limba side chair. 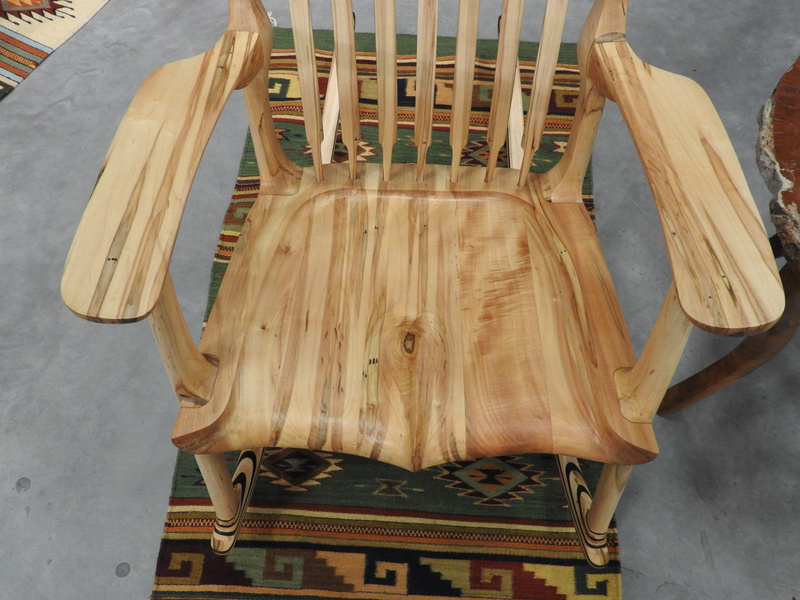 Head board of black limba side chair. 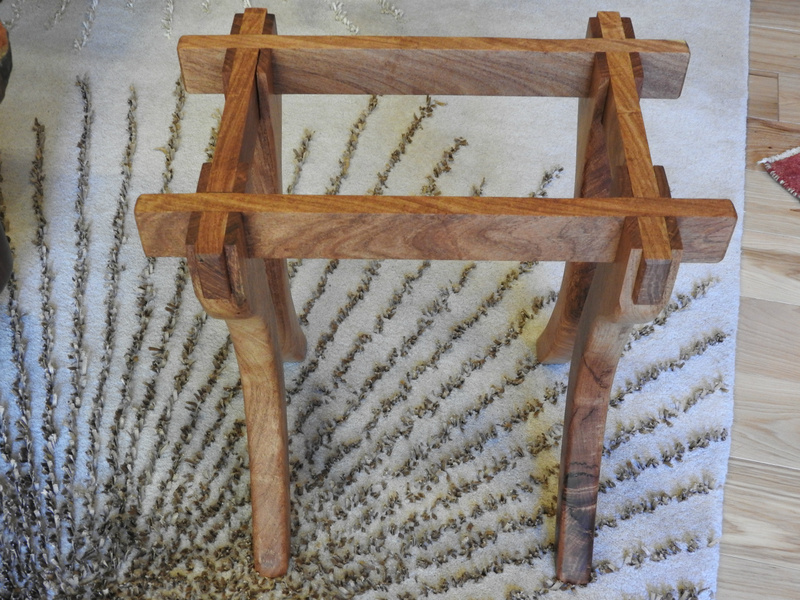 See view of chair showing Maloof style joints which are the strongest chair joint. 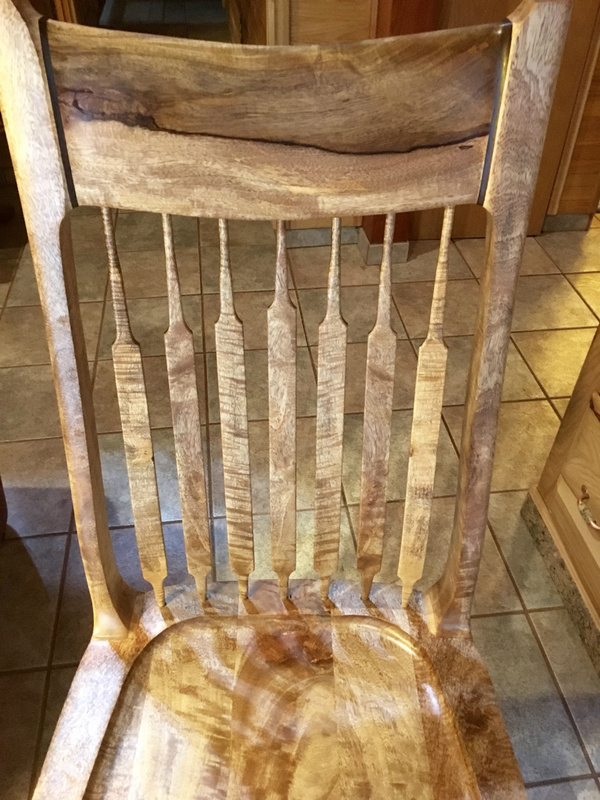 Office chair back of chairs showing base. 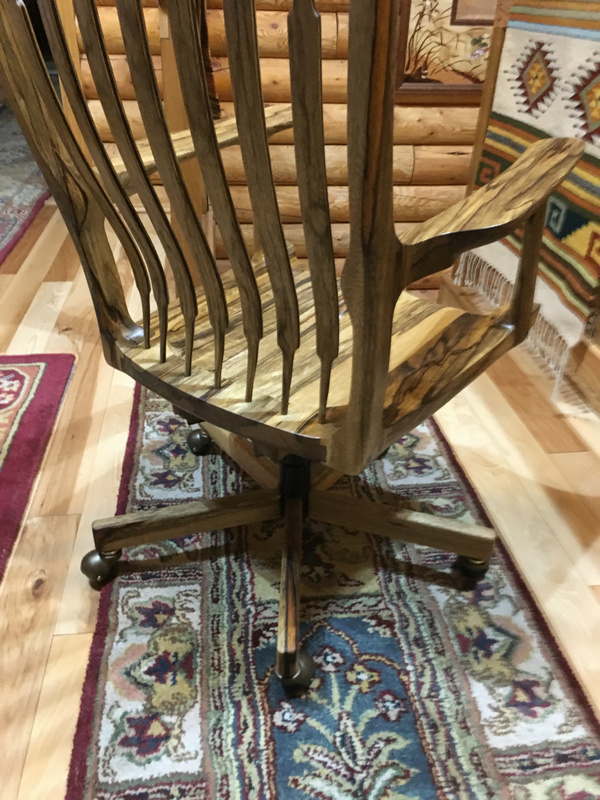 Office chair seat and arm details. 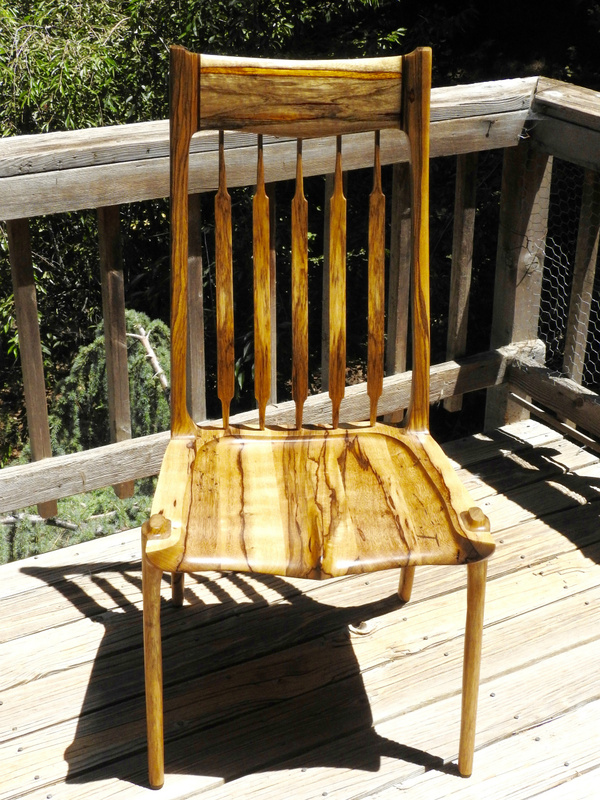 Side chair made of highly figured Hawaiian mango wood with wenge accents. 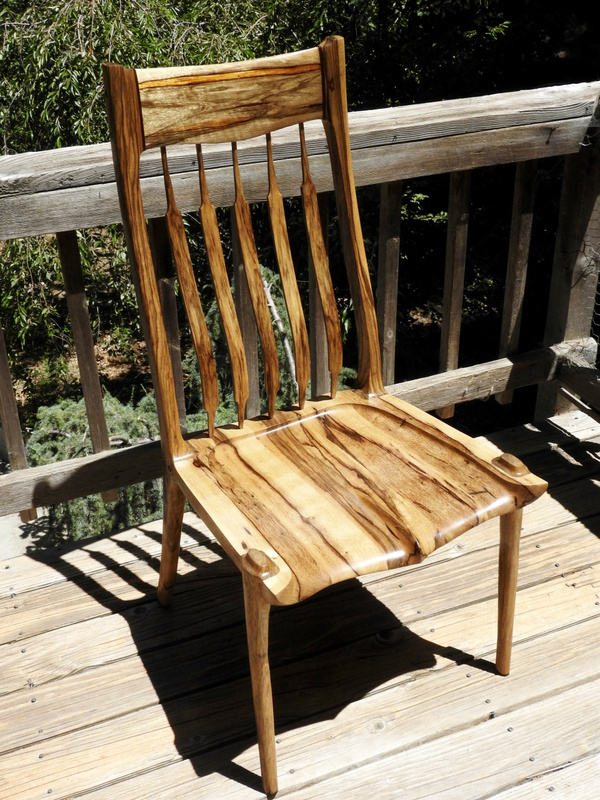 Chair has 7 laminated back slats. 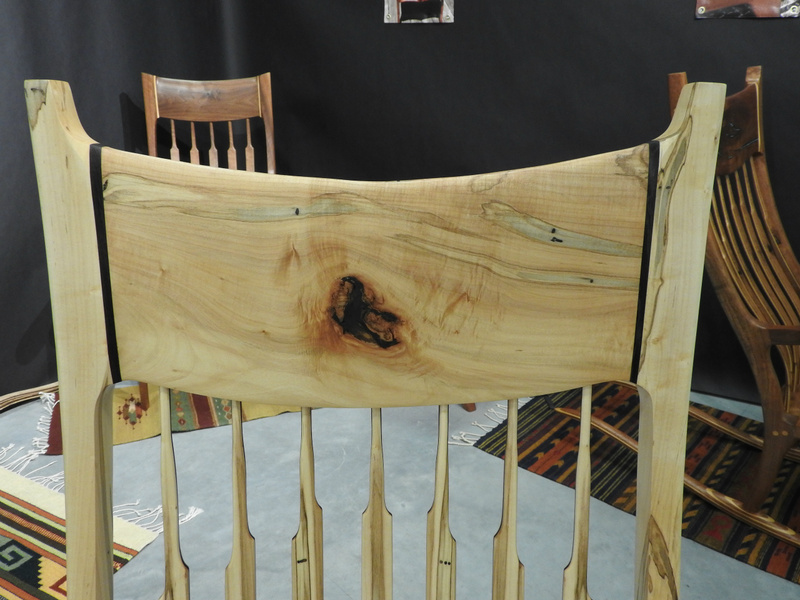 Details of headboard and book matched back slats on mango chair. 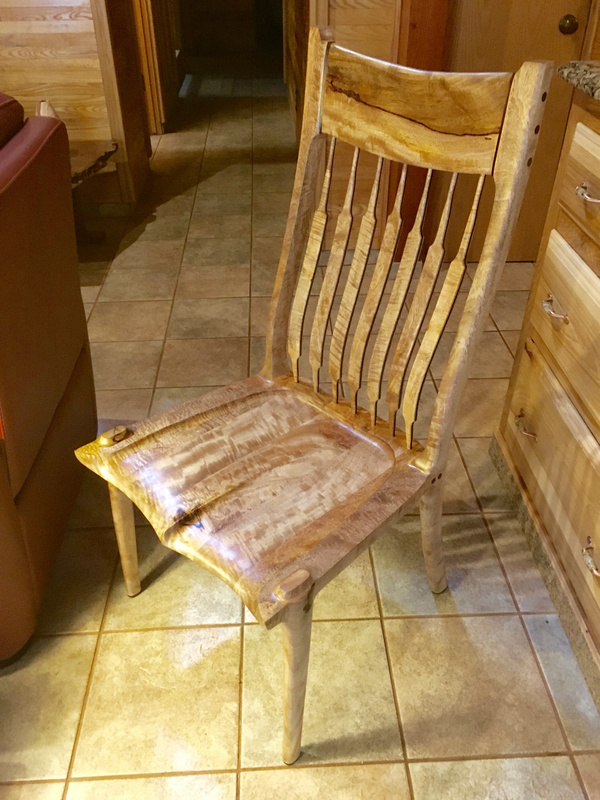 Three quarter view of mango side chair. 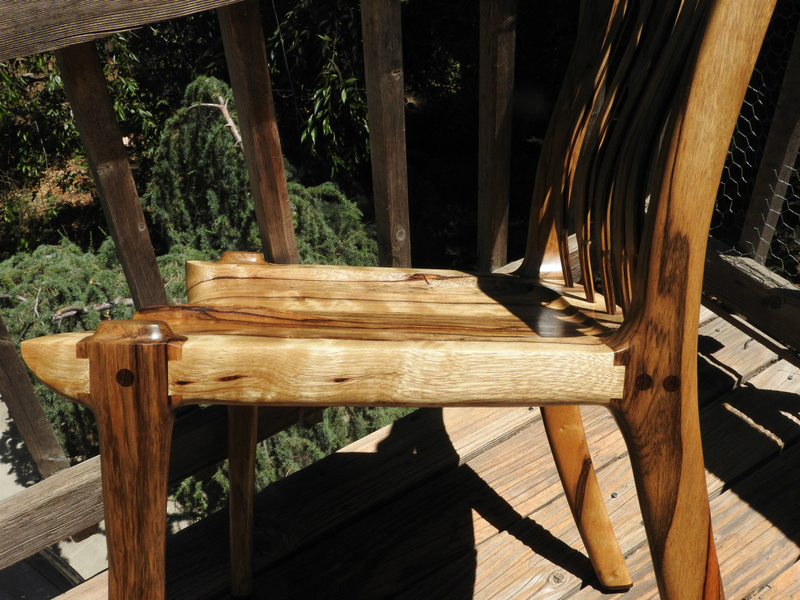 Details of Maloof style front leg seat joint and beautiful woodgrain in this mango chair. 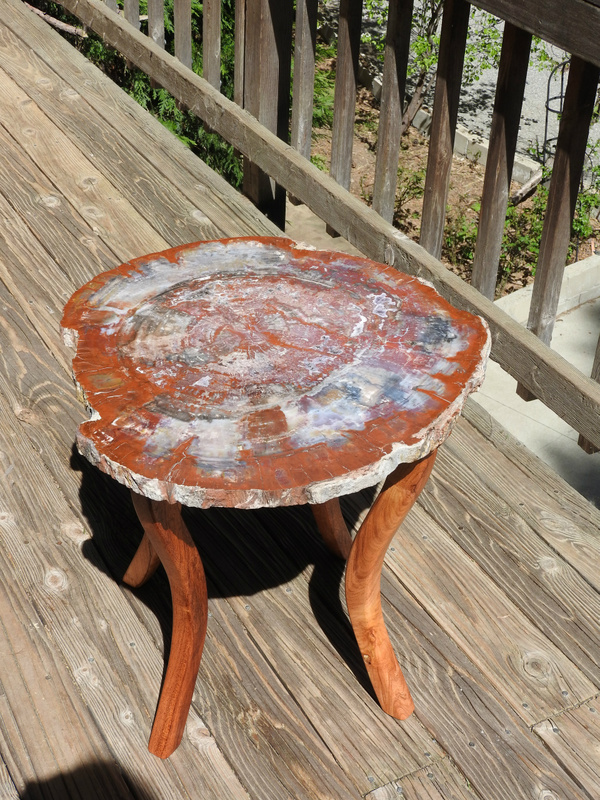 Arizona petrified wood side table with mesquite legs. 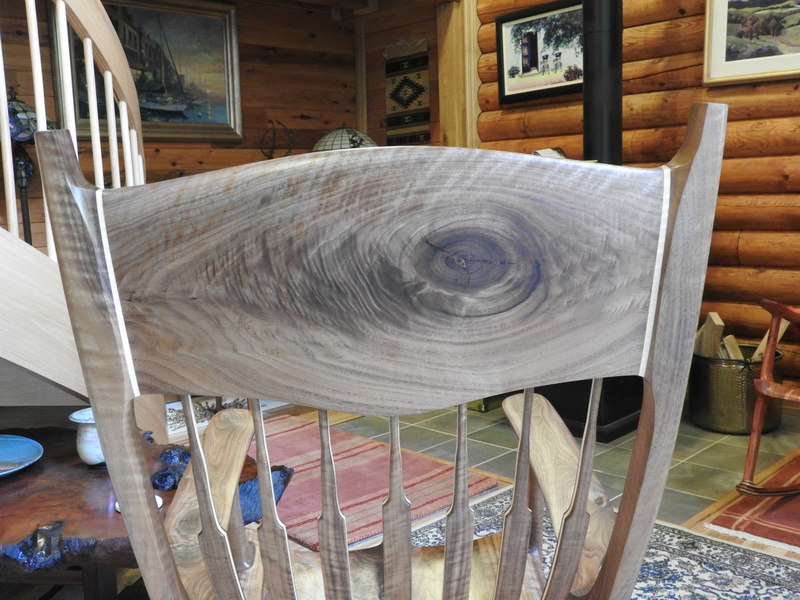 This table was one of a book matched pair. 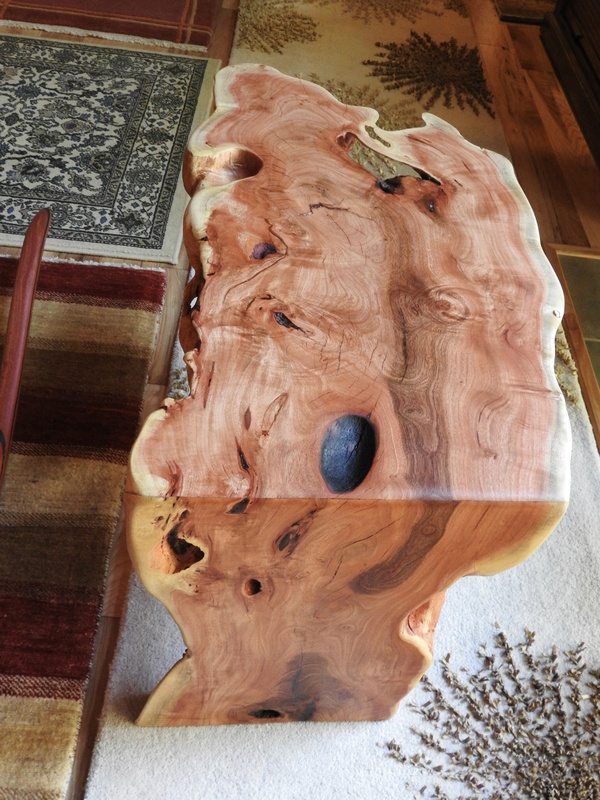 I have other petrified wood slabs to make into tables. 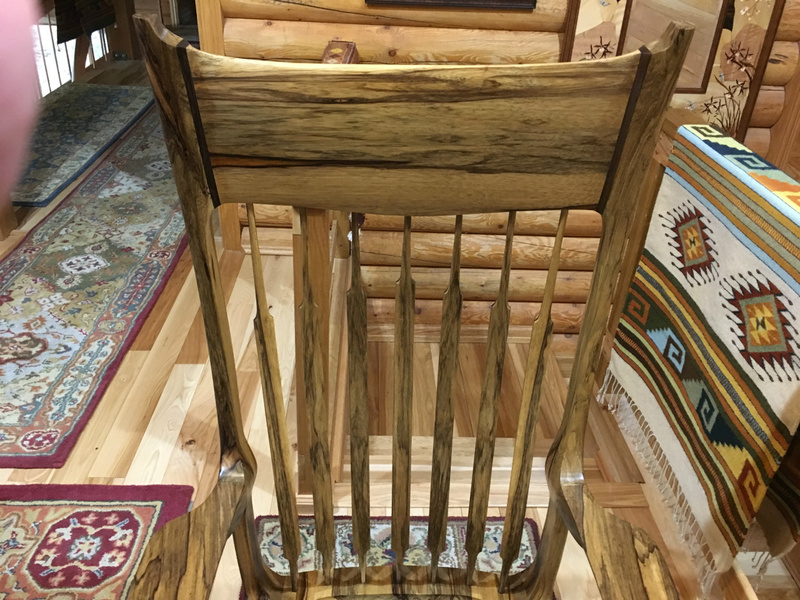 Prima vera wood from Mexico with wedge accents. 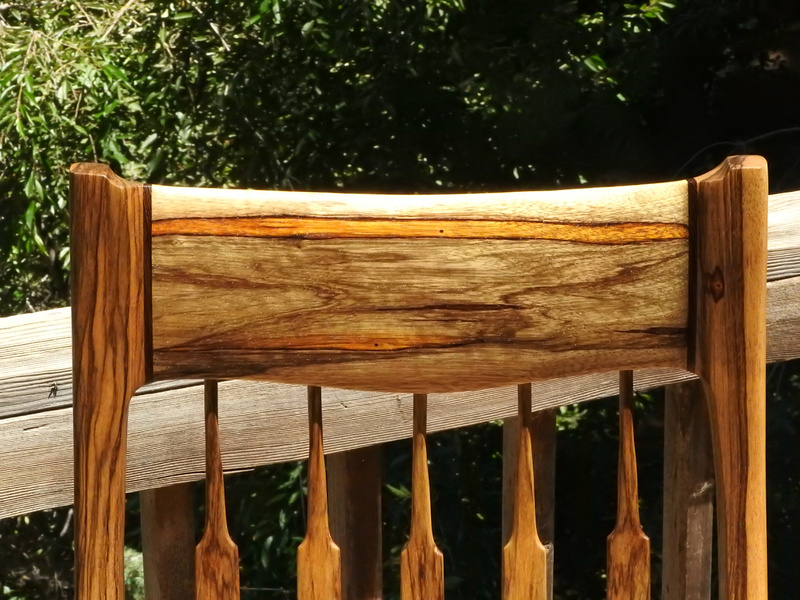 Prima vera rocker headboard with wenge accents. 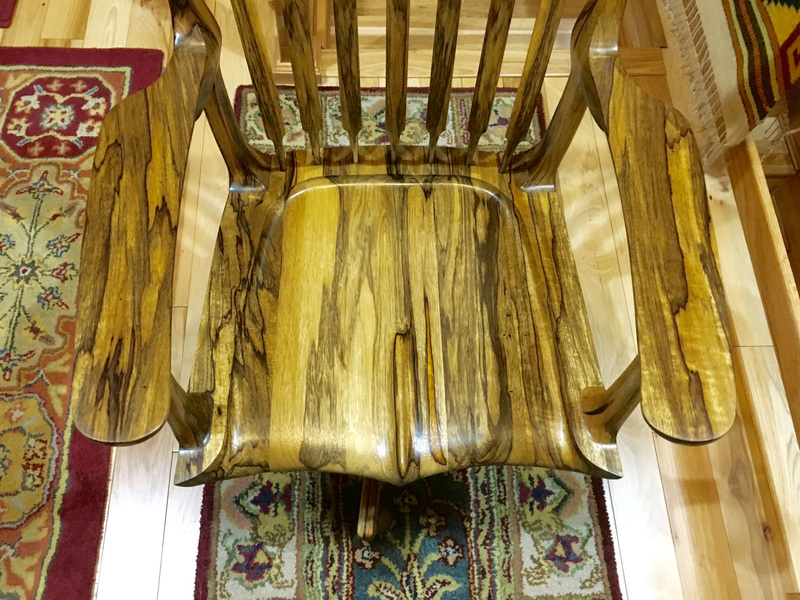 Seat and arm detail of prima vera rocker with wenge accents. 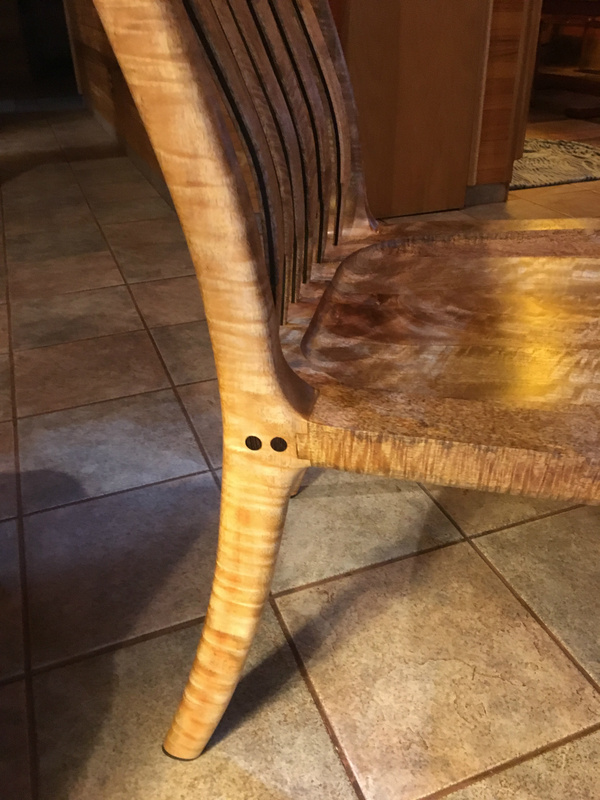 Headboard of walnut rocker with yellow heart accents. 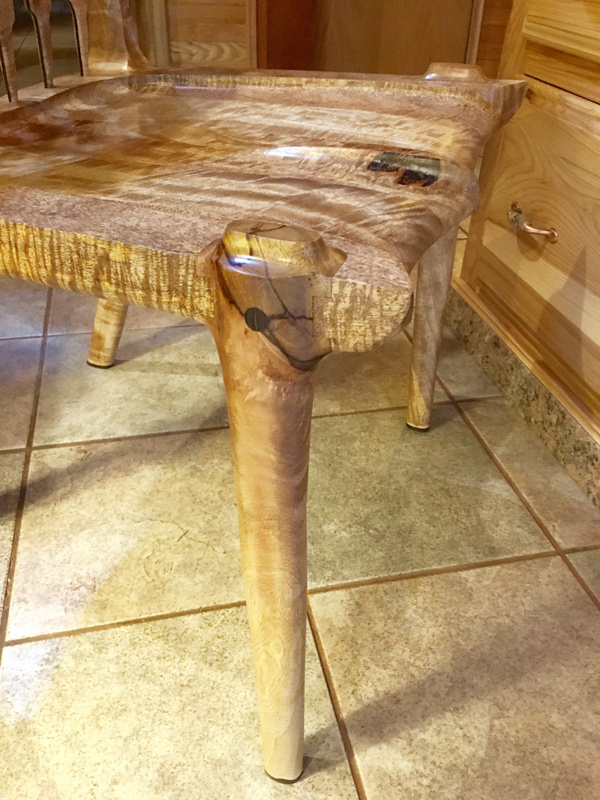 Arizona petrified wood end table with mesquite legs. 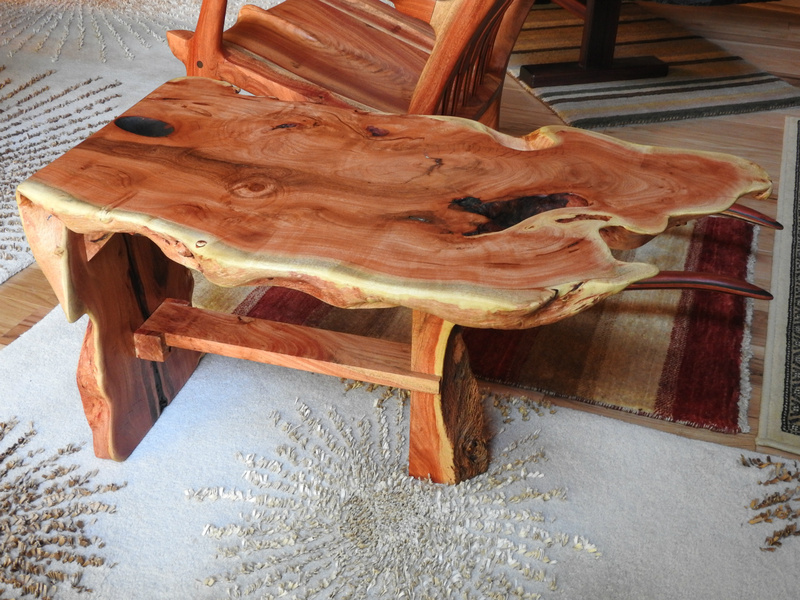 Mesquite base and legs for petrified wood end table. 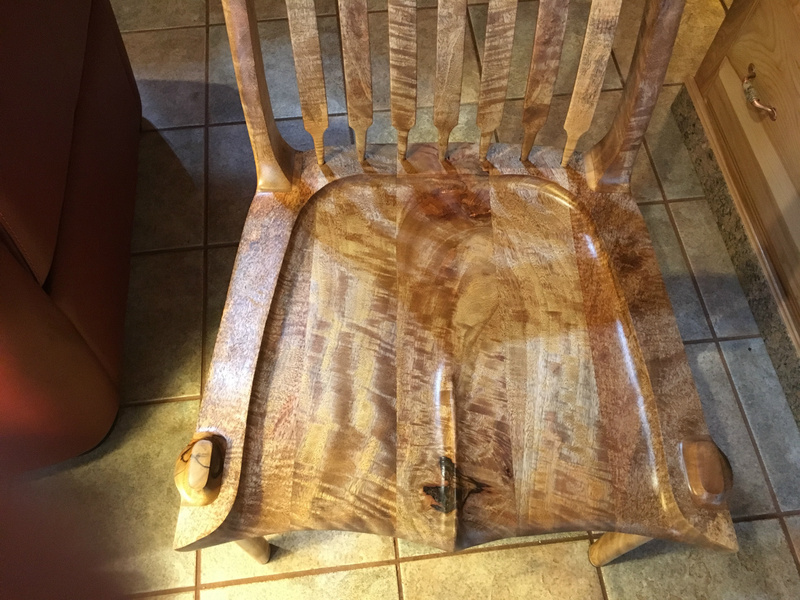 These new chairs were made in in 2017. 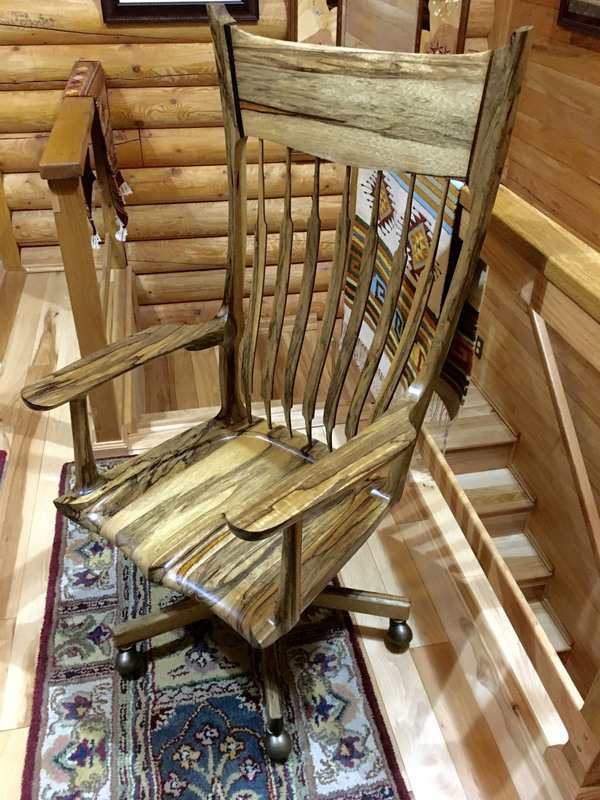 The new office chair sets on a traditional swivel base and can be made in numerous different kinds of wood. 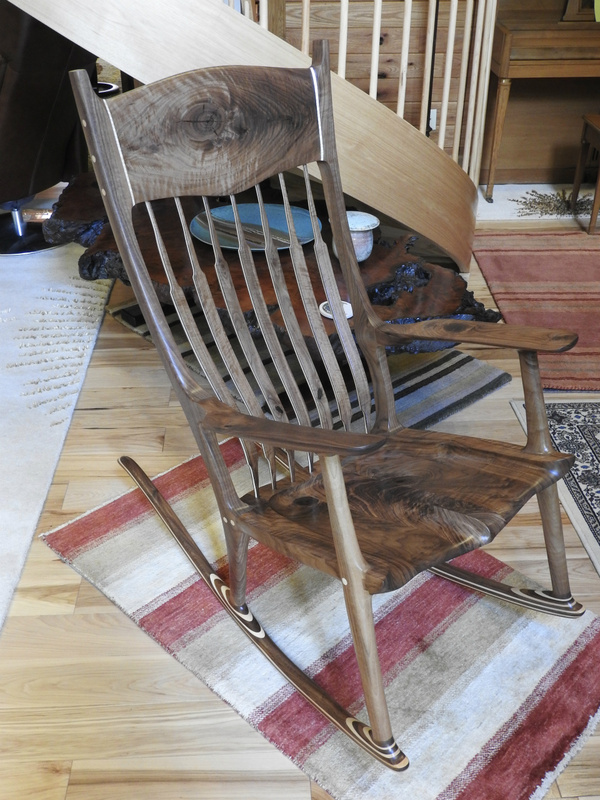 It features Malood joints, sculpted seat, and 7 laminated back slats for great support and comfort. 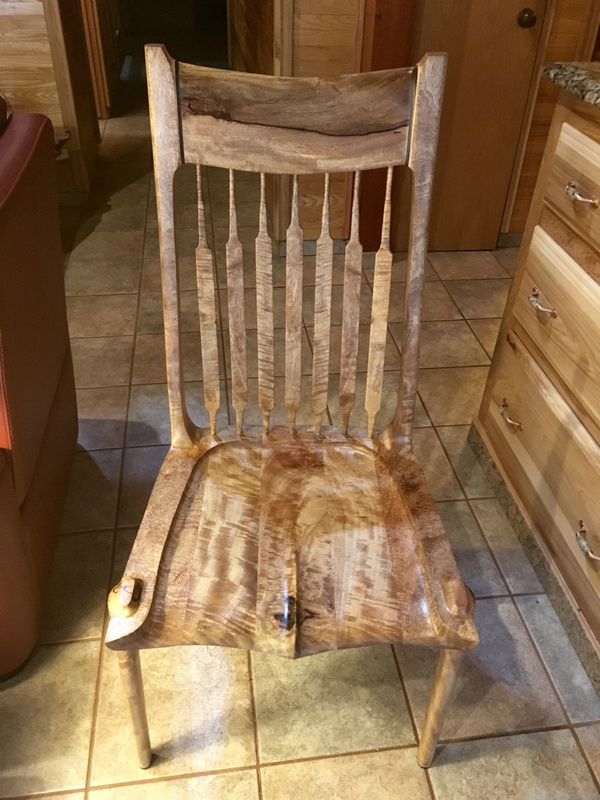 The side chairs are based on my regular arm chairs and have 5, 6, or 7 laminated back slats, Maloof joints, and sculpted seat. 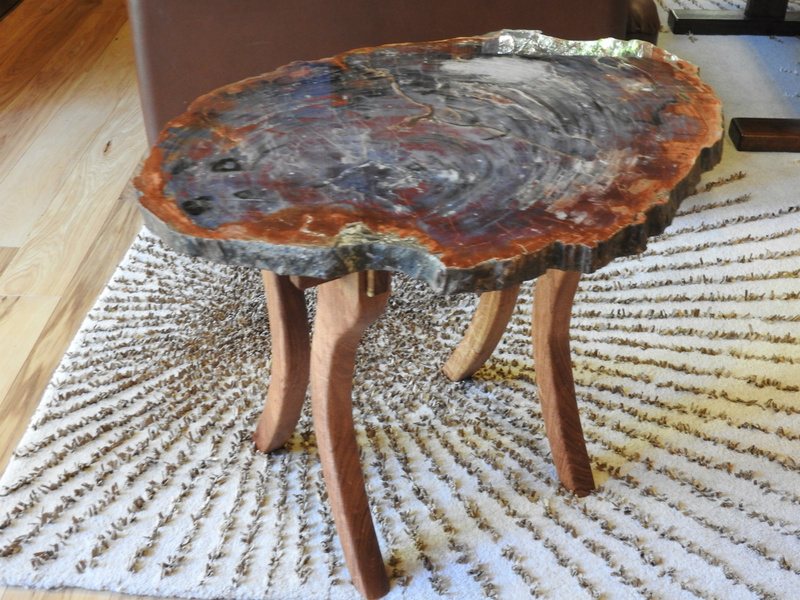 I have several slabs of petrified wood to made into small tables and can get larger slabs if looking for a larger table. 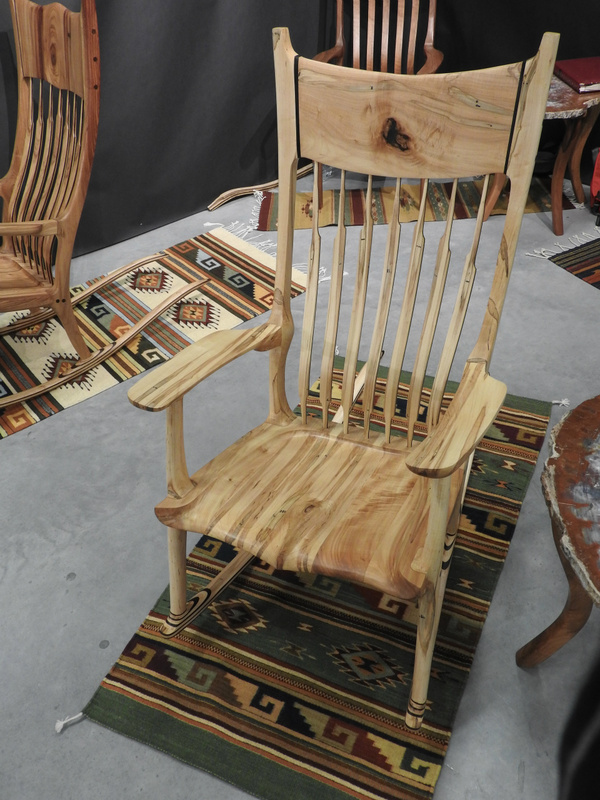 The base/legs are made of mesquite but other kinds of wood can also be used.